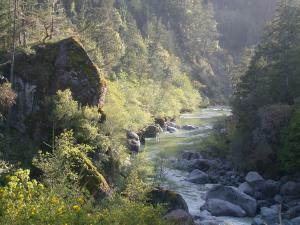 The Van Duzen river originates in the North coast region of California and empties out into the Eel river. Stretching approximately 63 miles the Van Duzen is a renowned hot spot for Salmon and Steelhead fishing. The Van Duzen offers up Chinook, Coho and Steelhead fishing opportunities, but on years where there is significant drought the river may be closed to protect the potentially endangered fish. Check with the California Department of fishing and Wildlife for closure information. This river generally offers fishing opportunities years round except for conservation closures.